Blog | Good Shepherd Lutheran Church | An inviting, inclusive, caring community grounded in God's Word and Sacraments which nurtures Christian faith and shares God's love. A Poem for Lent by Rob K.
In his Lenten devotional, “40 Days, 40 Prayers, 40 Words,” Bruce Reyes-Chow encourages readers to pause in the bustle of their daily lives to reflect, engage, and share during the Lenten season. Forty devotions are each framed around a word inspired by the daily lectionary readings and include a short scriptural passage, inspirational prayer, and reflection. Pastor Eric is using them for his devotions this Lent. Do you have any songs or images based on the parable that find meaningful? Last night, at our Lenten Soup ‘n’ Sing, we began a series of reflections on the names for Holy Communion. Every name for the communion meal recognizes that this meal is a means of grace in which we encounter the love of God in the eating and drinking of bread and wine. At the same time, each of these names also reveals a different facet of the mystery of this sacrament. This name emphasizes the relationship between the assembly and Christ and the relationship among those who eat the meal. When we eat and drink the bread and wine of the meal, we receive the body of Christ as the presence of Jesus and become the body of Christ as a community. We are bound together as one community by sharing this meal together, now and with those from every time and place. What other names do we use? Lord’s Supper, Eucharist, Mass, Sacrament of the Altar…we will be exploring these names over the next few Wednesday evenings. Welcome back to our blog! You’ve arrived just in time for Lent. We’ll be posting images and reflections for the season, some of which are submitted by our congregation. We hope they are meaningful to you. On October 18, we will celebrate our 55th Anniversary. The sending hymn that day will be the congregation’s favourite hymn, as selected by you! You may vote for up to three different hymns, but please vote only one time. Update: Our poll is now closed, and the votes will be tallied. A big thank-you to all who participated! Please join us this Sunday, October 18, to celebrate our 55th Anniversary and sing your favourite hymn! For further contemplation, here is a visual art piece relating to today’s reading from James. It is an image by 20th century artist Rene Magritte called “Not To Be Reproduced”. Magritte painted this Surrealist artwork in 1937 prior to the outbreak of World War 2. Europe was trying to make sense of a world turned upside-down by the First World War. Surrealist art found inspiration in dreams and the unusual juxtaposition of objects in order to reflect the confusion of modern society and the alienating effect of increasing industrialization. 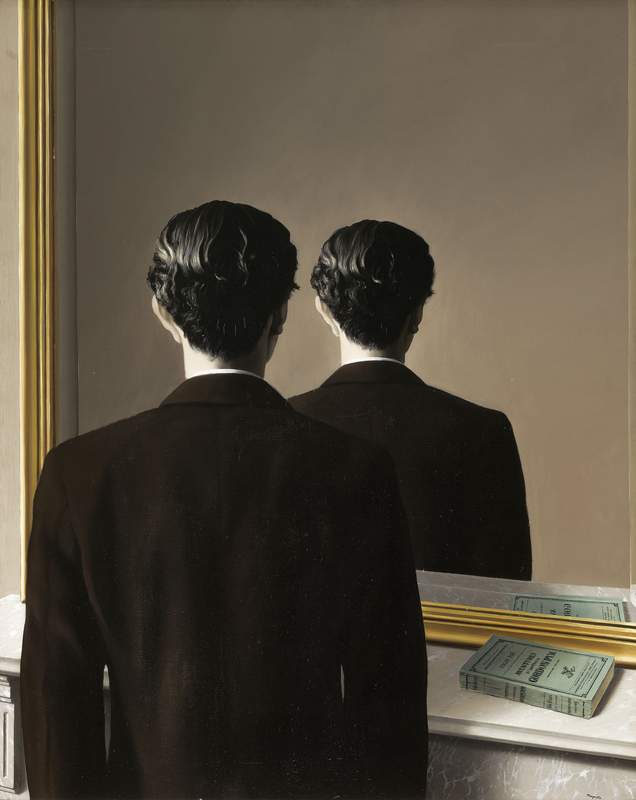 For more on this artist, see http://www.renemagritte.org. For further contemplation, here is a visual art piece relating to the reading from John 6 regarding the bread that does not give life and that which does. 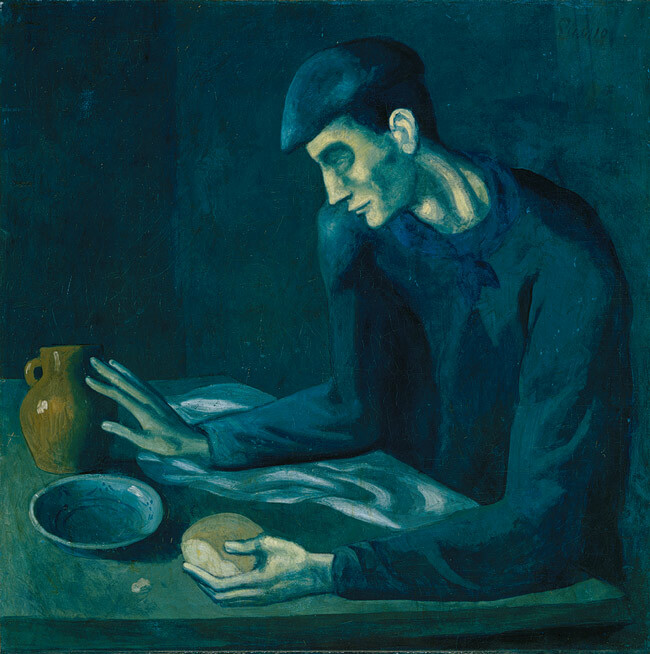 It is an image by 20th century artist Pablo Picasso called “The Blind Man’s Meal”. Picasso painted this in 1903 in the middle of his famous “Blue Period”. His art from this period was notable for its blue tone and themes of melancholy, human suffering, and depression. For more on this art work, see http://www.metmuseum.org/toah/works-of-art/50.188.